Since entering Cal Poly as a freshman in the Orfalea College of Business, Jessica Vasquez has been busy. Originally from Bakersfield, Ca., Vasquez became involved with the Hispanic Business Student Association (HBSA) her freshman year. Now a senior, Vasquez has served on its executive board for three years as Director of Finance, Vice President, and President. 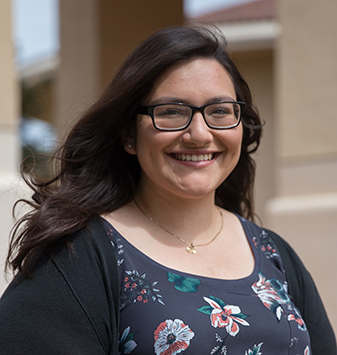 Shaped by her experiences with the HBSA, mentors and faculty of the Orfalea College of Business, Vasquez has become an effective leader and is excited to explore her internship with Moss Adams LLP in San Francisco before starting the Cal Poly Master’s in Accounting Program in August. As a freshman in the dorms, Vasquez knew she wanted to get involved but was unsure of what to join. Brimming with questions, Vasquez sought help from her dorm’s Residential Advisor. Vasquez would soon discover both a mentor and a confidant in her advisor, who would ultimately help push Vasquez to becoming so involved. As a freshman, Vasquez joined the Hispanic Business Student Association (HBSA), which is an Orfalea College of Business organization aimed at fortifying student academic and professional interests by unifying and empowering students. When positions on the HBSA Board opened up at the end of her freshman year, Vasquez’s advisor encouraged and motivated her to run for the Director of Finance position. Three years later, Vasquez has now been involved with the HBSA every year she’s been at Cal Poly. After holding the position of Director of Finance, Vasquez eventually ran and held the position of Vice President, then President after that. With the help of Justin Gomez, Academic Advisor and Success Coach in the Orfalea College of Business, Vasquez always knew she could receive countless advice and direction. Throughout her time with the HBSA, Vasquez was able to directly impact both students and the HBSA, as well as gain invaluable lessons on working with teams and becoming an effective leader. Vasquez also found guidance from others during her academic journey at Cal Poly. After taking a financial accounting course her freshman year, Vasquez was excited by the subject and decided to pursue an accounting concentration. It was after declaring her concentration that Vasquez found support from Sheri Boscaro, Executive Director for Accounting Excellence. Through Boscaro’s dedication to Vasquez and Cal Poly students, Vasquez was able to uncover her passions and gain support in her development. While her time as an undergraduate student will soon be over, Vasquez didn’t let that slow her down. With help from advisors Justin Gomez and Yovani Alexander, and with guidance from Sheri Boscaro, Vasquez was able to secure both an internship and an acceptance into Cal Poly’s graduate program. This summer, Vasquez plans to explore the Bay Area while interning with Moss Adams LLP in their San Francisco office. After, Vasquez will return to San Luis Obispo to begin the Cal Poly Master’s in Accounting Program. When looking towards her future, Vasquez hopes to continue her lessons learned from the Hispanic Business Student Association by encouraging high school students from underrepresented backgrounds to pursue higher education.